Spring is here. So do the barbeque parties outside your cute outdoor backyard. Who doesn’t love them? Oh, probably, those of you, who prefer to avoid the large mess after the barbeque parties! Well, we have news for you – there is no need to deprive your family and friends from this splendid experience. * Let’s start with the hardest job – cleansing the barbeque grill! First, scrub all the stiff wires. Then, scrub the grease, while it is not stuck forever on your barbeque. Continue with soaking the entire gadget into a mixture of warm water and dish washing soap. Get it out, polish with a microfiber and some essential oil. Rinse with cold water and your barbeque grill is as clean as a whistle! * Once you finish with the key element of your barbeque party, proceed with the outdoor environment. Make a short walk among your garden and patio and use the pick-up-tidying technique. Just grab a trash package and start gathering all the remains and garbage from the ground. * Order the garden furniture and check if they need some wiping and brushing. In case of accidental stains, get inside your house and find your favourite spot removal solution from the regular home cleaning equipment. Wash as soon as possible, because a forgotten stain becomes easily an old and impossible-to-be-erased defect! * Find some containers for food and keep the baked potatoes and burgers for tomorrow! You may get sweat from some tidying up today, but you will skip the cooking the next evening! So once again – who doesn’t love barbeque parties? * Last, but not least, sweep the space around your front door and fix the patio decors. Finally, bring the items from your house back indoors! 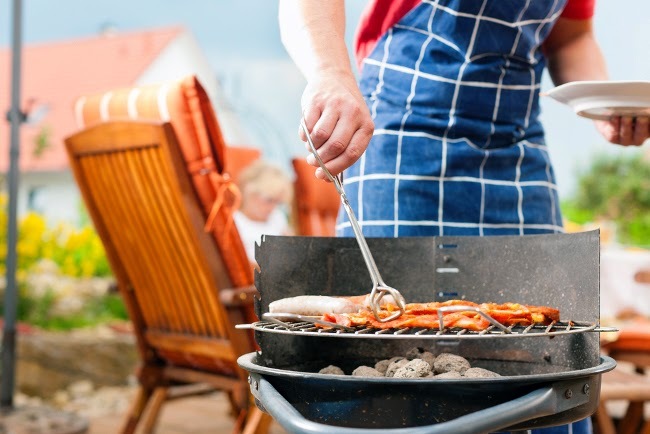 You may be now completely sure that a modest barbeque party does not require hiring professional cleaning services or using an entire weekend to clean afterwards! All these chores may be actually performed for less than an hour!